Hashim Qureshi's blog: Reasons for Indo-Pak stand off! Reasons for Indo-Pak stand off! Differences between India and Pakistan emerged with the partition of the subcontinent in 1947. Apparently these were about border dispute, water sharing, or Rann of Kutch. However the most complicated was Kashmir issue. Besides the wars of 1947 and 1965, the Kargil war of 1999 was also fought for the Kashmir issue. India did not only lend full-fledged help to the separatist movement in East Pakistan but also saw to it that East Pakistan was detached from West Pakistan in deference to the wishes of the Bengalis and for that she waged her war of 1971. According to some observers if the armed struggle of Mukti Bahini against West Pakistan had protracted it would have extended to Indian state of West Bengal as well. It would have developed in to a movement for Greater Bengal and in the process West Bengal would have slipped out of the hands of India. Not only that even Assam, Manipur, Tripura and Nagaland states too would have been adversely affected. Thus India quickly intervened to separate East Pakistan and claim that it was given so-called freedom from West Pakistan. India placed an obligation on Bangladesh and also averted the separatist movement in some of her states for some decades to come. India’s attack on Eastern Pakistan helped Pakistani nation and especially her strong army to nurse deep hatred against her which became the basis for seeking revenge from India. 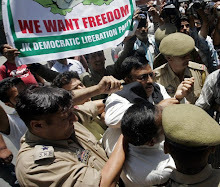 Kashmir question was there and hence it became the catalyst to the policy of encircling her. In the course of history, the Afghans began their war against the Russians in Afghan war. The US considered it a golden opportunity of avenging their debacle in Vietnam against Russia. By stating it war against infidels (kafirs), the US roped in all Islamic and European countries as well the European states for extending practical support to Afghans. Pakistan was made the base camp for operations against Russia. Thus war was begun in the name of Afghan jihad. Owing to her financial crunch, Russia had to withdraw from Afghanistan . Unfortunately, in the jihad against the Russians, no strong solidarity could be forged among the groups of Afghan jihadi. Therefore, even after the exit of the Russians from Afghanistan, the government of Najibullah Khan continued to be in place in Kabul. During the Afghan war against Russia, Pakistan was called upon to bear the burden of two million Afghan refugees. In order to feed the jihad in Afghanistan with human resource, thousands of Islamic seminaries had to be opened in Pakistan . Millions of persons were mentally prepared or indoctrinated in these seminaries for reinforcing the jihad. When fighting forces in Afghanistan like Haqqani group, Islamic Nationality group and Rabbani group indulged in mutual fighting, Pakistani authorities and her army decided to train the student cadres in seminaries and dispatched them against Najihullah regime in Kabul. These warriors came to be known as Taliban. The people in Afghanistan were fed up with internecine war among the warring groups after the Russians left the country. The emergence of Taliban, who would take quick action in deciding issues, thus was welcomed by the masses of people in Afghanistan. Najibullah was deposed and hanged. The whole of Afghanistan fell to the hands of Taliban. As the Taliban were brought into existence by Pakistan therefore they needed Pakistan and Pakistan needed them. In this way a new alliance came into being which secured Pakistan ’s western border in reality. Needless to say that the border dispute between Afghanistan and Pakistan had come to fore with the creation of Pakistan and that was called the Durand Line dispute. These ideas were expressed by late Sa’adu’d-Din at a dinner in the house of late Dr.Farooq Haider. Present in that assembly were late Husamu’d-Din, Ghulam Ahmad Bhat, Maulana Bari, Ayub Thukar, Dr. Farooq Haider, Rashid Hasrat, Ghulam Nabi Fai (perhaps) and I. I, in my capacity as Chairman Liberation Front, had hosted this dinner in the house of Dr.Farooq Haider in honour of Sa’adu’d-Din Sahib. Later on Pakistani authorities invited me also in my capacity as Chairman Liberation Front. 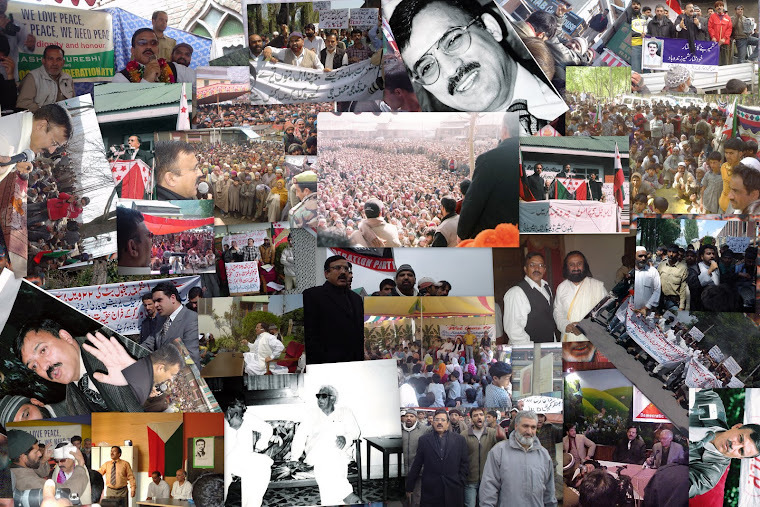 In Last months of 1985 or early 1986, Dr.Farooq Haider, Sardar Rashid Hasrat, Libertine Front General Secretary Zuber Ansari and I participated in the deliberations, which lasted nearly six months... Zuber Ansari and my stand were very clear. 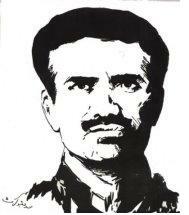 Liberation Front was for the complete freedom and self rule for the entire J&K State including Gilgit and Baltistan. I had put forth good suggestions for the liberating of Kashmir. But Pakistan had its own agenda and our suggestion fell through. Not only that, after that failure, it became difficult for me to live in Pakistan. I had to leave behind my family and seek asylum in Europe. Later on under the leadership of Amanullah Khan, our colleagues Sardar Rashid Hasrat, late Dr.Farooq Haider, and others gave the support of Liberation Front to ISI. At last even Jamaat-e-Islami also gave its support to ISI. However, events have shown that late Sa’adu’d-Din was right in his assessment. After this long prefatory, I would like to ask Indian rulers, policy planners, politicians and bureaucrats whether in the background of what has been stated above, it is ever possible for India to see that Pakistan will put and end to the jihadi organizations? It is never possible. India is a big country. It is a military power and growing economic power as well. It stands at par with China . Pakistani rulers and people are fully convinced that India wants to efface Pakistan one for all. As such to them India is their number one enemy. In these circumstances does not Pakistan have the right to make all preparations for her defenses? Therefore for Pakistan , Lashkar-e-Taiiba, Jaish-e-Muhammad, Taliban and others serve the advance force of her defense line. According to Pakistani commentators India is a big elephant. To counter it, it has to be bled by inflicting a thousand cuts on its body. And this is precisely the policy adopted by Pakistan against India. Furthermore China and India are involved in boundary disputes. They are also involved in trade rivalry on global level. This has cemented the alliance between Pakistan and China. Alignment with China has provided Pakistan a strong defense line. Geographically Pakistan is occupying a position which the world cannot overlook. In the war in Afghanistan , the US and NATO fully know that Pakistan can go only to a certain limit in war against Taliban. This is the reason why the Wiki Leaks has shed light on the relations between Taliban and Pakistan in detail. It is a different story that the extremist segment of Taliban and Al-Qaeda are making bomb blasts against Pakistan with the intention of weakening Pakistan. But the core force of Taliban knows that after their operations against NATO and the US in Afghanistan , it is Pakistan that becomes their base camp. Pakistan also knows that only Taliban can be their allies in Afghanistan. Therefore like any country in the world, Pakistan can be the ally of the US and NATO strictly to the extent of her interests. The US is aware of all these nuances. Therefore it is futile for India to tell the US and her allies repeatedly to bring pressure on Pakistan to dismantle the terrorist structure. India has been trying for it since 1990. She made strenuous efforts for last two decades to get Pakistan declared a terrorist sate but without success. The US and the European countries, too, cannot go beyond a limit in exerting pressure on Pakistan. If they really meant it they had many ways of increasing pressure on Pakistan. But that is not going to happen. The reason is that the US and European countries know that Pakistan is a nuclear power. If pressure was over done, then the extremists would come to power in Pakistan and her nuclear arsenal could be misused. India politicians and rulers ought to understand that Pakistan will never compromise on her defense concerns. India will have to survive for today and for the next day. She will have to iron out all he disputes with Pakistan. There is no way out other than dialogue to prevent terrorist perfidies like the Mumbai attack. An impression is created in Pakistani army and her population that India is not willing to resolve issues through peaceful dialogue. India shall have to bring about a change in her attitude so that this impression is removed from the minds of the people of Pakistan. Any tragedy like the Mumbai attack can flare up into a nuclear war between the two countries which would mean the annihilation of the subcontinent. In conventional warfare India could have an edge over Pakistan. Stonewalling Pakistan would fore her to take recourse to nuclear weapon which mean destruction of both. India is pacing at 8 to 9 % development while Pakistan is just at 4 to 5 %. If there is no bilateral dialogue, the extremists can cash on it. If another Mumbai happens then India has no alternative but to declare war on Pakistan. It is important that people to people interaction with Pakistan should be encouraged. Extremist attitude in regard to Kashmir should be given up and the issue should be resolved through dialogue with Kashmiris and Pakistan together. The extremists are enemies of peace and progress whether they are from India or Pakistan. India should remember that the US or European countries re not any body’s true friends, they serve their interests. India has to understand that China , a super power, would not let Pakistan go down as it touches her security concerns. Indian rulers should not show exuberance on the statement of Obama that India will be a member of the UN Security Council. Wiki Leaks has exposed the US not only on this but on many other issues. 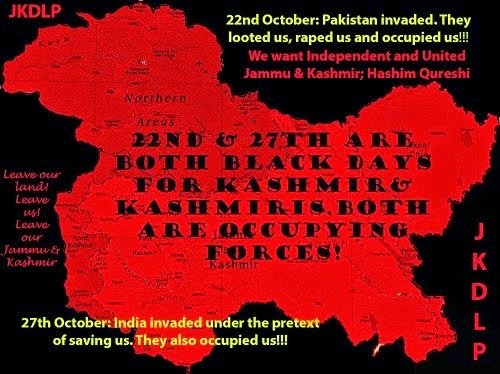 India should not forget that she has thrown the UN resolutions on Kashmir to winds. A country that has not acted on the UN resolutions cannot be a permanent member of the Security Council? Finally India should understand that the US wants only trade agreements with India in order to set right her economy.